The 39th edition of the Japan/USA Collegiate Championship will be held from July 6 to 12, 2013 in four venues across Japan. It’s a five-game series between two of the powerhouses of international baseball. USA and Japan are currently ranked second and third in the IBAF Men’s Baseball World Rankings, only trailing Cuba. The 39th Collegiate Championship between the two countries is officially sanctioned by the International Baseball Federation (IBAF). All games between national teams have to be sanctioned by IBAF. The 39th Japan/USA Collegiate Championship is hosted by four venues in the prefectures Ehime, Hiroshima, Tochigi and Tokyo in Japan. Game 1: July 6th(Sat) 14:00 Matsuyama Bocchan Stadium/Ehime Pref. Game 2: July 7th(Sun) 14:00 Matsuyama Bocchan Stadium/Ehime Pref. Game 3: July 8th(Mon) 18:00 Mazda Zoom-Zoom Stadium/ Hiroshima Pref. Game 4: July 10th(Wed) 18:00 Utsunomiya Kiyohara Stadium/Tochigi Pref. In 2011 Team USA won the series 3-1 (one tie) with games being played in Durham, Cary (both North Carolina) and Omaha (Nebraska). 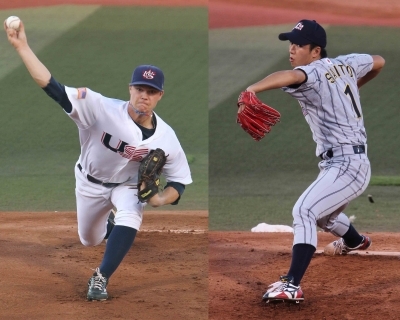 Overall the US squad has won the duel between the two Collegiate Teams 22 times, the Japanese squads 16 times. The first edition was played in 1972.